I’ve been saving some of my online earnings for this Canon digicam. This is not the latest one but I really like PowerShot SX130 IS because aside from its 12-megapixel resolution it has what I want most a 12x zoom and 720p HD movie recording features. 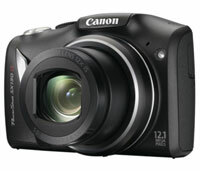 Now there's an enhanced version of this the Powershot SX150 IS with 14.1MP and 12x zoom.